Smart Reply is a new interesting feature for Google’s Inbox app. It provides automated replies for incoming emails. 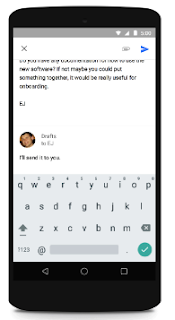 Using a complex algorithm of machine learning, Smart Reply will do a quick analysis of the content of emails and suggest few responses that you can choose to use in your replies. If you are like us and always lagging behind in your email replies, Smart Reply can save you some precious time and help you get back to your emailers quickly. Smart Reply will be released sometime this week and will be available on both Google Play and the app Store.